Book Review: You got it! The word Phantasy created by the author resonates with 'fantasy' and that is what the book is all about. The realms of imagination that sets you off to a magical kingdom away from the existing Singapore of the 80's. This happens to be the first part of the trilogy as per the author and he is successful in creating characters which give a lasting impression. The storyline is interesting but becomes predictable at times and there is not much for the reader other than a bedtime story. Highly recommended for children and teens but for adults the only catch is again 'fantasy' and if you love imaginative stories then this is the one for you. The plot of the story revolves around the king of the magical kingdom, his heir to the throne who is also the lead character and of course the antagonist played by a demonic character very well created which I believe is most essential for a good fantasy story to click. The only thing which could be improved upon is the romance which comes a bit too late and finishes earlier than expected. The best part is the way the contrasting sequences of a real Singapore vis a vis the magical kingdom have been depicted. The language is simple and self explanatory at times which keeps up the pace and helps in breaking the monotony. Finally the book is worth giving a good read and is excellent for gifting to youngsters keeping in mind the decent wordery of the book and the strata of imagination. Well, then how did the Prince save his kingdom and what did he eventually lose in the battle? You guessed it. The answer could be found in the links below. 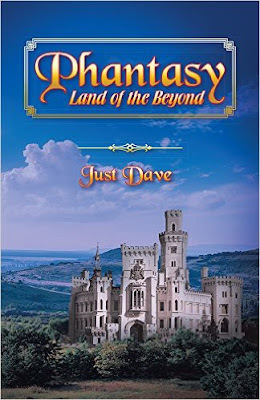 So go ahead and satiate your 'fantasy' err I mean 'Phantasy' courtesy Just Dave!